All in all, today's Mass readings are pretty firm and hard-hitting. Yes, they pack a punch for all of us. Our Lord does not soften the blow in His message to those who cause scandal. Neither, however, does St Paul in his letter to Titus in which those in teaching authority in the Church are given sharp and clear advice about how to live and - and I can't help feeling this is timely - what to believe and what to teach. Oh for a little clarity like this from Rome, or, indeed, certain quarters in England and Wales! Pope Francis, according to Vatican Radio, said that 'Jesus chose to be blunt rather than polite to get the message through to the Apostles.' Just how 'polite' is Our Lord in the rest of the Gospels and when? Polite is nice, we are taught to be polite, but polite is not necessarily as a virtue. Only on Sunday we heard how Our Lord threw over tables in the Temple. Polite? 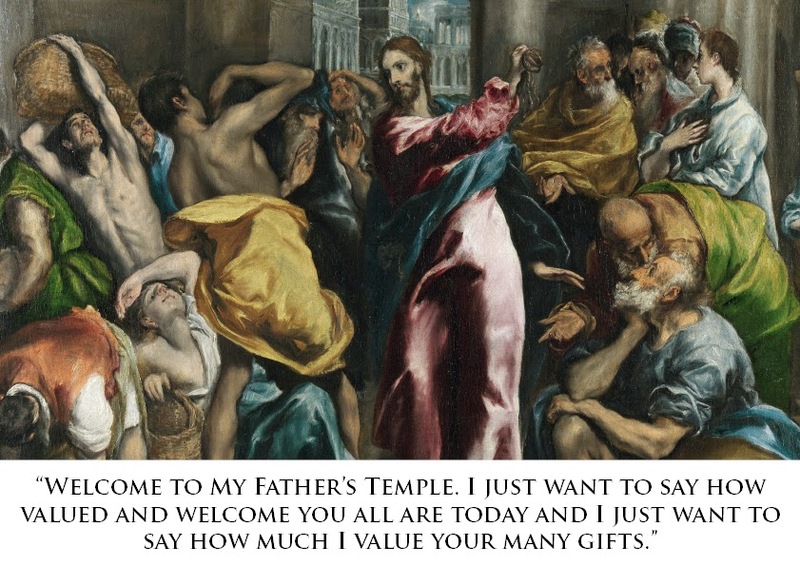 Perhaps Our Blessed Lord should have reassured those who made the Temple "into a marketplace" that though He was not keen on the practice, and therefore when on a cleansing mission, how 'valued' and 'welcomed' these individuals were! 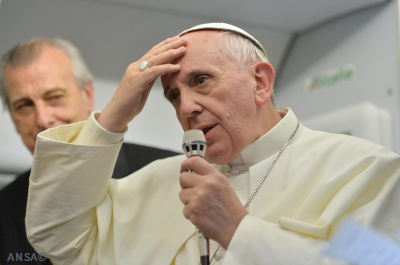 Many Catholics feel a little 'under the cosh' at the moment. A little 'scandalised' by recent events at the Synod and, indeed, a little scandalised by the lack of clear teaching coming from Rome. It is interesting, therefore, what His Holiness chose to focus on in his homily this morning and what he decided to overlook. First, the millstones. Well, that is quite a frightening phrase from Our Lord. "Obstacles are sure to come, but alas for the one who provides them! It would be better for him to be thrown into the Sea with a millstone put round his neck than that he should lead astray a single one of these little ones." Hmm...oh dear. A single one? Gulp. Well, I'll be frank and say that I have, at times in my life, many times indeed, led people away from Jesus Christ rather than to Him. This is truly a terrible thing. If a lay man can cause spiritual and moral damage to others through his selfishness and sin, how greater then is the impact when a priest or worse a bishop fails to lead men and women to Christ through his life and especially through his teaching? 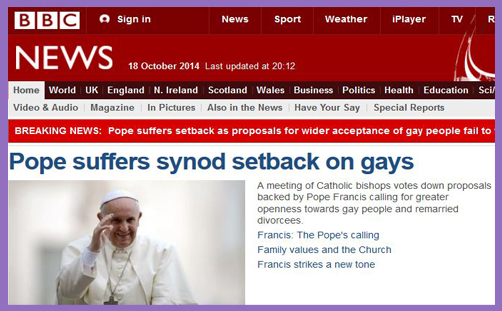 Then how much greater is the damage when the man in question is a Pope? A single little one, a few thousand or one billion? I won't labour the point. After all, only Our Lord can judge His Holiness. Who am I to judge? In our part of the world, we have recently experienced this first hand. Bad, in fact, woeful neglect in teaching and a terrible example of scandal that destroys faith and the Church's message. Despite his personal failings, it has been lamented by many that what really hurt was the individual's decision not to teach that which he was charged with the duty to teach. That is, the Catholic faith and Catholic morals. "Little ones", perhaps as the individual did not understand, need not mean children. The individual said words to the effect, "Don't worry, it wasn't with minors!" It can simply mean those who are weak in faith, ignorant of the Gospel, vulnerable, placed in your care, those who need instruction and teaching because you are in authority over them. Now, it so happens that St Paul places at the end of his 'person specification' for a man in teaching authority over others in the Church "a firm grasp of the unchanging message of the tradition" and the reason why. Why? So that he can "be counted on" (is trustworthy and dependable) for both expounding the sound doctrine and refuting those who argue against it." He must be dependable to teach the Faith. St Paul first takes us through what kind of a man he should be, for example, if he were to be a bishop. He runs through the moral character of the individual; "self controlled, devout, not given to wine etc." Then, St Paul tells us what he must know, what he must teach and tells us that he must refute error. The personal life of a bishop can be a cause of scandal but so, too, can his teaching. If he doesn't teach sound doctrine and "the unchanging (unchanging? yes! unchanging!) message of tradition" then to Christ and His Church he is useless and worse than useless - a hindrance to souls being saved - a cause of their destruction. If he does not teach the tradition and sound doctrine of the Church - Christ's doctrine - and he does not refute error then it would appear from St Paul's letter to Titus that he is not doing what he is called to do. That St Paul places this at the end of his 'job specification' does not mean it is the least important in the criteria. It is placed at the end because it is the only thing named as a 'job description' immediately after having listed the personal qualities the man should have. What happens to those in authority who do not obey the words of Jesus Christ and ignore St Paul? Why would it be better for him to be thrown into the Sea with a millstone put round his neck than that he should lead astray a single one of these little ones? The answer, we can ascertain, is because Our Lord makes clear that there is not an earthly punishment that would do justice to the crime committed by the individual. The punishment that fits the crime is eternal and horrendous beyond our imaginings. What punishment is it? The punishment is Hell: Eternal damnation and separation from God. It means Mitres, or rather those who wear them, falling into Hell if they do not obey Jesus Christ and carry out their vocation to teach the Faith. 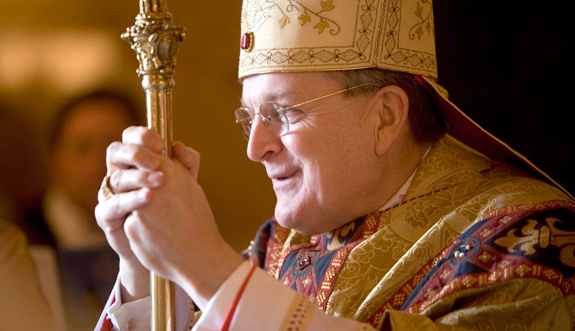 Cardinal Raymond Burke: He was only doing his job! I think I'll leave it there, suffice to say that what His Holiness chose to focus on in his homily today is interesting and so, too, is what he chose to overlook, as is what he almost daily chooses to overlook and cast aside, namely, his role to teach the Faithful and the unfaithful the Catholic Faith, which he must know and to refute the errors of the age both within and without the Church for the Salvation of Souls. I'm not judging His Holiness, you understand, I'm merely stating an observation from what I see and hear from his own words and those things about which he chooses to remain resolutely silent. Those in authority over the little ones, be they priests or bishops or popes are called to know the unchanging (it cannot change) tradition of the Church and to teach and refute error for the salvation of souls. The bishop or Pope's personal qualities are important to the extent that he must be holy and strive for holiness - but his one function is to teach what has been handed on - the unchanging tradition and sound doctrine. Not his private opinion. His Holiness says 'Don't be afraid of newness'. St Paul, on the other hand, says, "Ignore newness." Why, because, "he must have a firm grasp of the unchanging message of the tradition, so that he can be counted on for both expounding the sound doctrine and refuting those who argue against it." It looks like St Paul might have some sympathy with one Cardinal Raymond Burke. Who has a firm grasp of the unchanging message of the tradition and who can be counted on for both expounding the sound doctrine and refuting those who argue against it? Who has not and who cannot? Who resisted error? Who refuted it? Who cast tradition and sound doctrine aside or made it appear that he had? Who stood up for the truth? It goes without saying that I am, as a layperson, myself a 'little one'. My view might be unwelcome today by bishops and even the Pope himself but still, I am 'scandalised of Brighton' after recent events and I know many others are as well. God help you if, in your arrogant determination to push through a humanistic agenda contrary to God's own laws, you ignore us! May God have mercy on me for those times I have led souls astray and preserve me from doing so again and may God give us holy priests and even holier bishops. Matt 5,19: "Whosoever, therefore, shall break one of these least commandments, and shall teach men so, he shall be called the least in the kingdom of heaven: but whosoever shall do and teach, he shall be called great in the kingdom of heaven. 20 For I say to you, that unless your justice abound *more than that of the Scribes and of the Pharisees, you shall not enter into the kingdom of heaven." The Haydock Catholic Bible Commentary offers this in verse 19: "He shall be called; i.e. (by a frequent Hebrew idiom) he shall be the least in the kingdom of heaven; that is, according to St. Augustine he shall not be there at all; for none but the great in sanctity and virtue shall find admittance into heaven. (Witham) --- Do not then imitate the Scribes and Pharisees, who content themselves with instructing others in the precepts of the law, without practising them themselves, or if they observe the letter, neglect the spirit of the law, performing what it ordains, not to please God, but to satisfy their vanity. (Calmet)"
God Bless Little One ...you have spoken for this poor sinner and I'm sure Many others! Keep on with this wonderful blog site! It is true that by our sins, failings and limitations we too have scandalized others. It is also true that we have ourselves been scandalized by the events surrounding the Synod and many other happenings in recent months. In the current situation, the cautionary words of the Rule of St. Benedict in Chapter 2 seem especially apposite. May the Lord change our hearts and have mercy on us all. When the sheep go astray, you don`t blame the sheep.